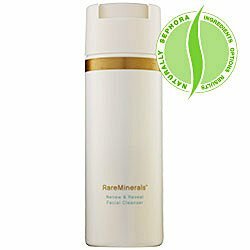 What it is:A unique, mineral-based cleanser in a concentrated powder form.What it is formulated to do:Bare Escentuals presents a revolutionary concept in cleansing with RareMinerals? Renew & Reveal Cleanser. It gently cleanses, exfoliates, and nourishes skin back to its natural radiance for deeply purified, baby-soft skin. When water-activated, it releases the benefits of our exclusive skin-renewing 100% pure RareMinerals?, healthy antioxidants and soothing botanicals to reveal fresher, smoother, and more radiant skin.What else you need to know:Renew & Reveal Facial Cleanser contains no drying detergents, harsh abrasives, or other skin-irritating chemicals and is ideal for all skin types and conditions. I have very sensitive, dry, red skin, and am 40 yrs old. I was using Cetaphil cleanser for daily washing, everything else made me too dry/too red. But Cetaphil didn't get the makeup off well, and I never felt deeply clean. I tried this, and I have to say it is the only cleanser other than Cetaphil that did not irritate my skin. It comes out clean feeling, and not dry, but soft. I love it. Unfortunately, I hate spending this much on a cleanser because my Dermatologist told me even with my skin I didn't have to buy any special cleansers, they have such brief contact with the skin it's not worth it... but I will probably buy this again. The powder seems to last a long time. Different than ANYTHING out there! This cleanser is the best I've ever used. I have had problems with acne ever since I had my first baby and I've tried all the acne products out there Pro Active, Murad...) and nothing has worked... until now. Not only has my skin cleared up (completely in less than a week), it's softer than it's ever been in my adult life. My skin glows now. I have been nothing but happy with all of the Bare Escentuals products I've used (have used their BareMinerals foundation for years)and this product is as wonderful as I would have expected. I also use the Skin Revival Night Treatment and the Blemish Therapy. These 3 things combined have proven to be the most amazing skin care regimen I have ever used. I have been using Bare Escentuals RareMinerals Renew & Reveal Facial Cleanser for almost two months now, and I really love it! I have very sensitive skin, and I have to be careful with what I use on my face. I have used Bare Escentuals makeup successfully, so I thought I would give this a try. This cleanser is in powder form, and to use it, you wet your face and your hands and pour a small amount into the palm of your hand. Add a few drops of water and rub the water in gently. The powder becomes a creamy cleanser, and can then be applied to your face. You rub it in gently, and rinse. I found this product very easy to use. The bottle is well designed, and only a small amount of powder comes out when you tip it over, and gently squeeze- no huge blobs of powder. I like the scent-there is a faint smell of mineral or vitamin smell, but its so faint you can barely smell it. The color is an off white. When you rub it into your skin, the cleanser thickens and stays where you put it. I have had this current bottle for 8 weeks, and I still have 1/4 powder left. I use this morning and night. I have had no bad skin reactions, and my skin is very smooth and soft. It is a gentle cleanser, and I love rubbing it into my face! It cleans very well with no residue, but leaves your skin soft and moisturized. A great product!